The first-ever, women-only space isolation experiment was held in November. Participating potential space travellers shared impressions of their experience on the project’s official Facebook page. A selection of the most interesting entries is given below. Six young women from the Moscow-based Institute of Biomedical Problems at the Russian Academy of Sciences spent nine days and nights in a hermetically sealed capsule completely isolated from the outside world. The experiment was intended to simulate a flight to the Moon. The participants’ log entries would make an engrossing book. 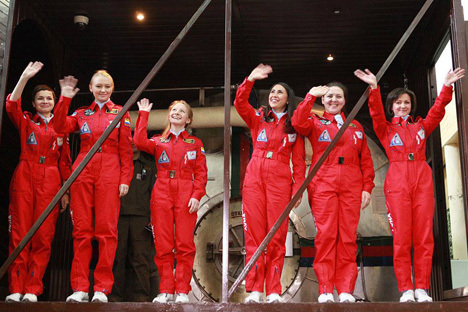 The women described the experiments they were conducting and how hard it was to adapt to life in an isolated capsule. They wrote about their high and narrow beds, unusual food heated in a microwave, limitations on personal hygiene, and lack of contact with the outside world apart from work-related radiograms. “For me, the hardest thing was not to have any information about my nearest and dearest… Where they are, what they are doing, and what is happening to them,” said project participant, Anna Kussmaul. The conditions in which they had to perform the experiments caused the six women considerable difficulty and discomfort. To record their physiological reactions to the physical hardships, the “astronauts” had to attach electrodes to their bodies and occasionally keep them on for up to 24 hours, which caused skin irritation. There were two emergencies onboard the capsule during the experiment. First, the women had to give first aid to a fellow crew member who had been electrocuted (the role was performed by a mannequin). As part of that assignment, a real-time telemedicine link was established with a Moscow hospital, where doctors managed the process. Less than 24 hours before the scheduled end of the experiment, participants were told “the landing” was being postponed for 24 hours because of “a storm” at the Vostochny cosmodrome. There were mixed reactions to the news. As part of the Moon-2015 project, Russian scientists studied mechanisms that a human body uses to adapt to an isolation capsule, tested equipment for the International Space Station, and studied the psychology and physiology of the female body during a long space mission. During the project, some 30 experiments were conducted, whose findings will be processed by researchers at the Institute of Biomedical Problems over the next several months. Of particular scientific interest is a comprehensive analysis of data --- how the respiratory, cardiovascular, immune and other systems reacted to the isolation capsule. Scientists will also conduct a comparative analysis of the data received in previous experiments that involved male participants. It is expected that the Moon-2015 project will be the first in a series of space isolation experiments of different durations.